Foam Cutting Pad - The cutting pad is made of a dense but flexible foam capable of removing moderate swirls, scratches, and oxidation. It should be used with a swirl remover for the best results. Foam Polishing Pad - The polishing pad has a less dense consistency capable of removing light swirls and oxidation when used with a light swirl remover or fine polish. Foam Finishing Pad - The finishing foam pad is very soft and has no leveling ability. Use this pad to apply waxes, sealants, and glazes and produce a high gloss shine. If you're a professional detailer, it's helpful to have fresh pads on hand for large detail jobs. Cutting and polishing pads, in particular, may require more frequent pad changes due to paint transfer. 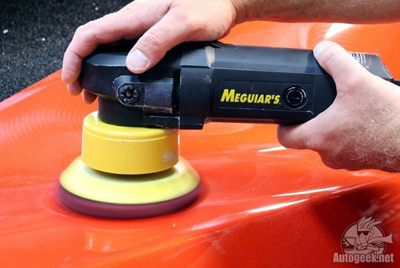 For best results, Meguiars 5 Inch DA Foam Discs should only be used with the Meguiars DBP5 5 Inch Backing Plate.